Some registers don’t seem to be blowing any air. This is often one of the first signs of HVAC airflow issues. Do you have doors slamming closed or strange whistling noises and drafty areas? These are symptoms of air pressure problems caused by poor HVAC airflow. Your AC system blows, but it blows warm air. Now you know you better call a HVAC specialist. Ignoring the issue will put a strain on your system, which can lead to your compressor failing. Think of the compressor as the heart of your air conditioner, and when it goes, it is very costly to replace. The good news is many of the causes behind HVAC airflow issues are relatively inexpensive to fix. The condenser is your outside unit that houses the compressor, a fan and other electrical components. Outdoor units especially can become obstructed due to leaves and debris that have accumulated around the unit. Your system can overheat when there’s not enough access to air. Your first step to improve HVAC airflow should be to clear any bushes, shrubs or debris from around the unit. The condenser is also made up of coils. The job of the coils is to release the heat from the home. Coils can become impacted with debris from normal use causing the unit to work harder and much hotter to cool your living space. Chemically cleaning your coils, once or twice a year is a good habit to get into. Walk around your home and make sure that you don’t have any closed registers or registers that you have put furniture up against, blocking the airflow. I know your couch looks really good up against that wall, but comprising the airflow creates undue hardship on your HVAC unit. Your HVAC system has blower fans that move the air through your ducts and out through your registers. 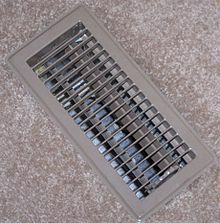 If a blower motor is sluggish, that can hinder the ability to push that air through the ducting and out the registers. In some cases (especially in restaurants) the fan itself can become coated with grime which slows the operation and reduces airflow. Cleaning the fan blades of dirt and debris is an easy fix. Remember that plugged air filter that you forgot to change? Where do you think that dirt and debris ends up? It winds up accumulating in the ductwork. A buildup of dust and debris in your already narrow ducting and become clogged easily restrict airflow. The walls of the ductwork can also develop cracks or tears where air can leak out. If you live in an area where rodents can get into your attic or under your house, the ductwork is the first place they like to build their homes. All of these ductwork issues lead to reduced airflow for your HVAC unit.